Darlington senior Bryce Stone scores on a drive to the hoop during the Redbirds' 61–50 victory at Fennimore on Tuesday, Dec. 18. POSTED December 27, 2018 11:36 a.m.
FENNIMORE — The battle-tested Darlington Redbirds boys’ basketball team was back at it on the court last week, knocking off two more ranked Division 4 teams on the road to remain unbeaten on the season at 8-0 and alone atop the SWAL at 4-0. The Redbirds defended their first-place standing in the SWAL by defeating the #8-ranked Fennimore Golden Eagles, 61-50, at FHS on Tuesday, Dec. 18, and then headed to New Glarus on Thursday, Dec. 20, where they rallied from behind in the second half to take down the #1-ranked Glarner Knights by a score of 70-64. Through their first eight game, the ‘Birds have beaten four state-ranked D4 opponents, including a pair of wins against teams who were ranked #1 coming into the game. 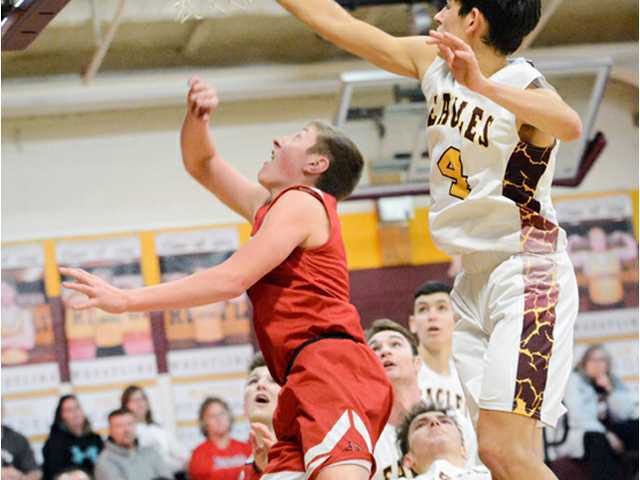 At Fennimore, on Tuesday, the Redbirds broke off on a 14-2 scoring run in the first half to jump into the lead, and then used a late 9-0 run to put away the host Golden Eagles, 61-50, for a key SWAL victory. After Kellen Kenney sank three quick baskets to shoot the Eagles (7-2, 2-2) out to an early 8-4 advantage, the ‘Birds got 3-pointers from seniors Trae Schilling, Bryce Stone and Matthew Douglas to shoot into an 18-10 lead. Douglas added his third trey of the first-half to put the ‘Birds up by five with around three minutes remaining in the half, while Schilling and sophomore Cayden Rankin closed the half with baskets to send Darlington into the locker room at the intermission sporting a 29-22 lead. Kenney (10 points) and Warren Adam (seven) combined to score 17 of the 22 points to keep Fennimore in the game. The Redbirds protected their lead the entire second half, fighting back the Eagles five times after they cut the deficit back to two points. Adam, who netted 14 of his game-high 21 points in the second half, got the hosts within two on three occasions and Kenney sank a pair of free throws with around four and a half minutes remaining to pull the Eagles within 50-48. Schilling and Rankin went back-to-back with baskets once again to extend the lead to six, and the ‘Birds went 3-of-6 from the foul line– two coming after Adam’s fifth foul and a technical foul which was called on Kenney following Adam’s last foul– to open up a 57-48 lead with two minutes to play. Rankin, who finished with a career-best nine points, tacked on a breakaway layup following a steal to put the ‘Birds up 59-48 with 1:11 to go, and the Eagles had no time left to respond. Douglas scored 11 of his team-high 13 points in the first half to lead the Redbirds, while senior Stryker Fitzsimons tallied nine of his 12 points in the second half. Stone added eight of his 11 points in the second half, and Rankin netted seven of his nine in that half as well. Schilling finished with eight points, while the Redbirds’ leading scorer, sophomore Carter Lancaster, was limited to six points by the Eagles. “Fennimore had a similar plan as far as trying to limit our top scorers. They made things hard for Stryker and Carter, but that created opportunities for our other guys to step up. Matt had a big first half, and Bryce had a big second half to help pick up the scoring (slack). Trae and Cayden were also both near double figures in scoring,” noted Uppena. Fennimore’s top two scorers, senior Reid Larson and sophomore Adam Larson, came into the night averaging 21 and 19 points, respectively, on the season but were held to just seven and four points during the game by the ‘Birds. “The credit goes to our defense in the win over Fennimore. That was as good of a performance of individual and team defense as I’ve had from one of my teams. Holding the Larsons to 11 total points when they each average around 20 is the result of incredible effort and execution of the game plan,” Uppena commented. At New Glarus, on Thursday, Dec. 20, Stryker Fitzsimons scored all 23 of his points in the second half while Carter Lancaster added 13 of his 16 points in that same stanza to rally the Redbirds over the top-ranked Glarner Knights, 70-64, in a non-conference shootout. “New Glarus was a great road win for us. It was a playoff atmosphere and a great test for us to see how we would be able to handle that kind of defensive pressure. I was really happy with how our bench responded when we got into some foul trouble. Michael Riley and Cade Murray, who haven’t seen big minutes this year, stepped up in a big time game and kept it to a one-point game at the half,” said coach Tom Uppena. The Redbirds trailed 25-24 at the half, but came back to outscore the Knights (7-1) by a 46-39 in the second half after sinking 18-of-20 on their 2-point attempts following a concerted effort to work the ball inside. “We certainly weren’t perfect handling the pressure, but we were better the second half in being a bit more patient and then getting into our half-court offense. We felt we had a big advantage in the post, so the emphasis was to get it inside to Stryker and Carter and let them go to work. Stryker missed a lot of the first half with foul trouble, but was a man on a mission in the second half. We were able to get high percentage shots and get to the free throw line,” explained Uppena. Darlington went 16-for-31 from the foul stripe on the night to finish six points better than the Knights, who shot 10-of-14 on the night. Matthew Douglas contributed 11 points for the balanced 'Birds, while senior Carson Evenstad added eight points and Trae Schilling netted six in the win. Senior Zach Feller led the Knights with 19 points after connecting on five shots from beyond the 3-point arc. Senior Jaden Kreklow, who recently became New Glarus’ all-time leading scorer, was limited to 12 points on the night, while sophomore Darrin Schuett added nine points. Darlington will host Lancaster in a non-conference boys’-girls’ doubleheader at DHS on Thursday, Dec. 27. The varsity boys’ game will start at 6 p.m. with the varsity girls’ game to follow at approximately 7:30 p.m.
Darlington– Cayden Rankin 9, Trae Schilling 8, Bryce Stone 11, Carson Evenstad 2, Stryker Fitzsmons 12, Carter Lancaster 6, Matthew Douglas 13. Totals – 24 8-16 61. Fennimore– A. Larson 4, R. Larson 7, Kenney 14, Adam 21, Kephart 4. Totals – 21 7-9 50. 3-point goals– D 5 (Schilling 1, Stone 1, Douglas 3), F 1 (R. Larson 1). Total fouls– D 12, F 14. Fouled out– F: Adam. Tech foul– F: Kenney. Darlington– Cayden Rankin 4, Trae Schilling 6, Carson Evenstad 8, Stryker Fitzsmons 23, Carter Lancaster 16, Michael Riley 2, Matthew Douglas 11. Totals – 26 16-31 70. New Glarus– Craker 5, M. Martinson 5, Feller 19, Schuett 9, Janssen 2. Kreklow 12, Siegenthaler 5, Gassman 7. Totals – 23 10-14 64. 3-point goals– D 2 (Douglas 2), NG 8 (Feller 5, Craker 1, Siegenthaler 1, Schuett 1). Total fouls– D 17, NG 28. Fouled out– NG: Siegenthaler, Martinson.